With the 2010 regular season now over it is time to turn our attention to 2011 and that means fixing all that is wrong with the Chicago Cubs as they ended the season in 5th place with a record of 75-87 and 16 games behind the division champion Cincinnati Reds. The signing of Marlon Byrd was a solid decision as he was excellent defensively, was well liked in the clubhouse, and contributed a solid season offensively. Ryan Dempster was solid winning 15 games and throwing over 200 innings as well as providing tremendous leadership in the clubhouse. Carlos Marmol was excellent all season long saving 38 games and dominating like no other reliever in the game. He does have his occasional control problems but he should be an elite closer for many years to come. Sean Marshall settled into the setup role very well and has emerged as one of the better relievers in the National League. His emergence calmed a very shaky bullpen that struggled in April and May. Finally, shortstop Starlin Castro exploded on the scene when he was called up to the big leagues in early May. He was solid at the plate and showed flashes of brilliance defensively despite commiting 27 errors. He should be a fixture in the Cubs infield for many years to come. **Breaking News** The Cubs are close to trading first baseman Derrek Lee to the Atlanta Braves, I have learned exclusively. The trade was first discussed on Sunday evening when the Braves called Cubs GM Jim Hendry and expressed interest after learning that one of their best offensive players, Chipper Jones was lost for the season with a knee injury. As a 10-5 man (10 years in the major leagues and the last five with the same team) Lee has the right to reject a trade as he did when the Los Angeles Angeles of Anaheim tried to acquire him in late July. However, sources close to Lee tell us that he will approve a deal to Atlanta because the Braves are leading their division thus giving him a shot at winning another World Series ring. Lee was a member of the 2003 World Champion Florida Marlins who beat the New York Yankees in the Fall Classic. The deal that would send Lee to the Braves has not yet been finalized but MLB sources characterize the trade as nearly done. One holdup has been Lee's balky back which has kept him sidelined the past couple of days. The trade is not expected to land the Cubs much in the way of talent because of Lee's subpar 2010 season but it will provide some salary relief as Lee makes 13 million dollars and the Braves are expected to assume most if not all of his remaining money. The Cubs started their overhaul of the roster for the 2011 season by trading pitcher Ted Lilly and 2nd baseman Ryan Theriot to the Los Angeles Dodgers for 2nd baseman Blake DeWitt and two minor league pitchers. Recently inducted Hall of Famer Andre Dawson said this week that the Cubs should pass on Ryne Sandberg and should instead take a run at New York Yankees manager Joe Girardi. Here are the comments that Dawson made in an interview on WSCR in Chicago. Please post your thoughts on the Cubs managerial position in the comments section. Thanks! The Cubs were approached recently by the Los Angeles Angels and the Texas Rangers regarding a potential trade for first baseman Derrek Lee. No names were discussed but the Cubs then went to Lee to see if he would waive his 10 and 5 rights which under Major League Baseball's collective bargaining agreement allow him to block a trade. Lee informed Jim Hendry that he will not accept any trade and would like to wait until the season is over to decide on his future. His current Cubs contract expires at the end of this season. Several reports have criticized Lee for his position but who are we to determine what is best for his future? He has the ability to block a trade and he exercised that right, plain and simple. With Lou Piniella's announcement last week that he is retiring as the manager of the Cubs the speculation has been in high gear as to who will replace him. From Ryne Sandberg to Bob Brenly to Bobby Valentine there has been no shortage of names tossed about. I have looked at this decision for a while now knowing that Lou would not be returning to the Cubs and there is really only one name that should be on the Chicago Cubs shopping list. New York Yankees manager Joe Girardi. Girardi is so obvious that I am stunned to hear some people tout others over him. Girardi is a winner who has multiple World Series rings as a player and has won one as manager of the Yankees. He was also named Manager of the Year when he was with the Florida Marlins and took a team with a 14 million dollar payroll and nearly made the playoffs. He has had small payrolls, large payrolls and has handled both situations very well. 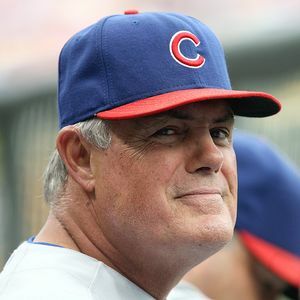 Cubs manager Lou Piniella will announce this afternoon that he is retiring at the end of the 2010 baseball season. I just spoke exclusively with Piniella and he did confirm that he is stepping down but he is very upset that the news leaked out before he had a chance to inform his team. "Yes, it is true that I am retiring. I am 67 years old and it is time for me to move on to the next phase of my life and to spend more time with my family. However, I am very upset that the news leaked out before I had a chance to inform my team," Piniella told me. Bill Madden of the NY Daily News learned of the impending announcement from Piniella's agent Alan Nero who told him the news in confidence. However, Madden did not keep the news quiet and thus the story broke, angering Piniella and his family. Piniella will address the media at 4:15 from the interview room at Wrigley Field. I will have full coverage of the announcement both on Chicago Tribune Live on Comcast SportsNet at 5:30 and on the Tenth Inning Show immediately after tonight's Astros/Cubs game on WGN Radio. What Keeps The Cubs From Winning? We all know it has been 101 years and counting since the Chicago Cubs last won the World Series in 1908 and it isn't looking like this season will end the longest drought in sports history either. On Saturday I interviewed Cincinnati Reds star Scott Rolen who has played many games in the Friendly Confines and asked him why he thinks the Cubs don't win. What he told me might surprise you but give the man credit. He spoke from the heart and was extremely passionate in his comments. DK: There is a lot of talk about leadership in a locker room. What is your take on the importance of leadership? That word is thrown around a lot. It was thrown around a lot when I was in Philadelphia. Leadership means a lot of different things to a lot of different people. The leadership aspect is a bunch of guys going out together and playing good baseball. When you're playing good baseball your winning baseball games then you have good leadership and you have good personnel. When you're going out and playing sloppy baseball and not winning ball games then we have bad leadership. I don't take it, I appreciate it. I take it as...a high regard and very complimentary. But we're trying to be professionals on and off the field trying to go out and play good baseball and stay on top of things and not let things get out of hand and have little brush fires along the way, just keep a nice clean clubhouse. DK: We hear all the time about bringing in winning type players because they have won championships and they have "been there before". Do you agree? Well, again I'm kind of a downplay guy, I think it's a little overblown. A winning player is a player that's on a team that won. That maybe didn't get a lot of at bats or get a lot of playing time. Whatever, there's something to it with individual guys, but it's individual personnel, case by case, there are special people in all sports that play the game that are infectious that have a way of putting people where they need to be. In the clubhouse keeping things loose, keeping things going in the right direction without a doubt. I do believe in that, but being a winning team and being a winning player, yeah I don't know. DK: You have played a lot of games here at Wrigley Field during your career. Why do you think the Cubs haven't been able to win here? I think I don't know is probably the politically correct answer. True answer? The facts or the truth? The facts? The facts as I see it, I think they have their hands full a little bit. I think they're limited in their facilities here, their batting cage, I think it limits their work. A little restricted obviously in the clubhouse and their weight room. A lot of facilities that other teams have. They play a different schedule than everybody in baseball. There's three things in my mind that are facts. I don't know if that's the truth because to me there's a difference between the facts and the truth. Well it's a night game now basically. You sleep in during the day, you play a lot of night games and you struggle with travel days and everyone struggles with day games. They're playing 50, 55, 60 whatever day games a year. It's a different schedule. So I know for us coming here playing four day games, we're beat. That's their season. That's what they're doing. It puts their backs against the wall a little bit. They have good players, they have good personnel, they know how to play baseball. They have a good organization, but you know honestly I think it's difficult for them. Like I said, when we're talking about facilities everyone talks about Wrigley Field. Great atmosphere we love coming here, the fans, batting practice, everything. Fantastic, the ivy the whole works. I'm in. There's a lot in the game today, there's a lot of beautiful facilities. That are geared towards working, towards perfecting you know your skill, towards video, you know a lot of things have changed in the game and I'm not sure what the other side looks like but you know batting cages and stuff, I think are a bit restricted. They have to work pretty hard, they've got their hands full. But great place to play, everyone loves playing here and good personel, good ball club, good players. If the Cubs do not show signs of life heading into the all star break I fully believe that we will hear from Chairman Tom Ricketts on his and his family's thoughts about the team and their plans for cleaning up the mess. So with that in mind here is what I would advise them to do to prepare for a very tough meeting with the media and the July 31st trading deadline. 1) Management must let the fan base know how frustrated they are with the on field performance and also let them know that it will not be tolerated and that change is coming to the Cubs in a big way. 2) Identify those pieces that have trade value and can be moved. That means there are no untouchables on the roster. However, it would take a huge deal to pry some of the best youngsters away from the Cubs. 3) Be willing to eat significant dollars to clear out the dead wood on the roster so that a complete overhaul of the team can begin as soon as possible. 4) Show the paying customer how much this season has upset you. They are paying a tremendous amount of money to support your team and they also invest their heart in a team that has broken it more times than they care to remember. They have to know that you are as upset as they are or you could see further declines in attendance and support. 5) Lay out a plan for the future. The Cubs fans will buy a plan if it is spelled out to them in a clear and concise manner. There has never been a definitive plan to rebuild the team. It has always been about trying to upgrade and compete all at the same time. Unless you spend Yankee level money that plan has very little chance of succeeding. 6) Talk about playing with pride and fire. That is much more of an indictment on the players than it is on the manager. However, when you see players like Derrek Lee and Aramis Ramirez struggle day after day and they continue to remain in the 3-4 hole on the days that they are playing it is no wonder that it appears as if poor play is accepted. Lee and Ramirez have been awful all season long but never have we seen them dropped down to the 6-7-8 spots in the order. When the White Sox were struggling in early June we heard Kenny Williams say that it would not be tolerated and that changes were coming if things didn't improve. He also said that "I'm tired of looking at this and so are our fans." By doing that he let everyone who buys a White Sox ticket know that he was as frustrated as they are and that it was unacceptable. We have not heard much of that from the North Side and that too is unacceptable. Several baseball sources have confirmed to me that the Chicago Cubs have been extremely active in trying to move Kosuke Fukudome to open up regular playing time for rookie Tyler Colvin. Fukudome is owed approximately 8 million dollars for the remainder of this season and an additional 14 million for 2011. My sources tell me that Cubs GM Jim Hendry has offered to pick up the bulk of the remaining dollars on the 2010 commitment and half of the money in 2011 but so far has found no takers for the under performing right fielder. I have also been told that upper management is being extremely patient despite the poor performance of the Cubs so far in 2010. They will wait a few more weeks and evaluate the club's position at that time before they determine a course of action in advance of the July 31 trade deadline. As I reported earlier tonight on Chicago Tribune Live on Comcast SportsNet the Cubs will sign reliever Bobby Howry to a deal that will be announced sometime in the next 48 hours. Howry was released by the Arizona Diamondbacks earlier this week and after clearing waivers the Cubs will only owe him the pro rated league minimum salary. Howry spent the 2009 season with San Francisco where he appeared in 63 games with a 2-6 record and a 3.39 ERA. The Cubs are denying the signing but friends of Howry have confirmed that he and his wife have told them that they are indeed returning to Chicago. So Did The Cubs Shop Zambrano? New York sources continue to insist to the Big Apple's news media that the Yankees took a run at Cubs starter Carlos Zambrano in the past week prior to re-acquiring Javier Vazquez from the Atlanta Braves. In fact, Friday's edition of the NY Daily News says that the Cubs did indeed discuss a deal and that the Cubs were willing to take back left hander Kei Igawa and the 12 million dollars left on his deal to try to make the financial aspects of a trade possible. So is it true? Were the Cubs shopping Zambrano? Sources very close to the Yankees who would not speak on the record told me that there was really nothing in the way of negotiations with the Cubs regarding Big Z. One phone call was placed to see if Zambrano was available, and Yankees General Manager Brian Cashman was told that short of an overwhelming deal in terms of talent, and the Yanks assuming all of the remaining 53 million dollars on Zambrano's contract, the Cubs had no interest in trading their #1 starter. So while there was a call made to gauge the Cubs interest, there really was nothing to the frenzy that hit the internet early this week regarding Zambrano and the Yankees. With Ted Lilly coming off of shoulder surgery, and Rich Harden now pitching for the Texas Rangers, the Cubs are very thin in the rotation. Trading Zambrano would be a foolish thing to do, unless the deal was a huge win for the Cubs. And with the Yankees payroll already at $200 million, there was no chance that they were assuming all of Big Z's contract. Tonight at 5:30 on Chicago Tribune Live on Comcast SportsNet we will be joined by White Sox GM Kenny Williams and his newest acquisition, outfielder Juan Pierre who was acquired in a trade this morning from the Los Angeles Dodgers for two minor league pitchers. Tonight at 7:00 p.m. on Sports Central on WGN Radio we will have an in depth discussion about the Chicago Cubs with three well known bloggers including Andy Dolan of Desipio.com. We will take calls and look at the 2010 season and the remaining free agents that the Cubs might have interest in. **Please note that new Notre Dame football coach Brian Kelly will join me on Sports Central on Thursday evening. I read Phil Rogers column in the Chicago Tribune yesterday and came away scratching my head at the premise that Phil is using-- that the Cubs should have traded for Curtis Granderson because the Yankees didn't need Granderson as badly as the Cubs. They already have Derek Jeter to be their leader and ambassador. Phil, Granderson had a lousy 2009 season. He hit .183 against left-handed pitching. He had an on base percentage of .327, and he struck out 141 times. Yes, he is an outstanding defensive player and a wonderful human being. But the Cubs have to get better players in their clubhouse, not just better people. The Cubs don't have the financial flexibility that the Yankees do, because the Yankees have $60 million more to spend on their payroll. The Cubs were interested in Granderson, yes, but not at the expense of trading a handful of their best prospects to acquire a guy who is a better person than he is a player. The Yankees are planning on starting Granderson in center everyday, but he will not be their lead off man. The Yankees hitting instructors evaluated his swing by looking at tapes of his at-bats against left handed pitching in 2009, and compared it to his swing in previous seasons when he was much better against left handers. They now believe that they can correct what's wrong with his swing, and the tremendous talent that surrounds him in New York will make his transition to the World Champions that much easier. He was much better against right handed pitchers in Detroit and in Yankee Stadium as a pull hitter with a short porch to right field he could have a much better season. It wasn't a fit for the Cubs given the price tag the Tigers set. Phil, you don't trade a lot of your best young talent just to get a leader in your clubhouse. He has to fit as a player as well and the fit is much better in New York than it would have been in Chicago. CHICAGO - Ted Lilly yesterday afternoon underwent a left shoulder arthroscopy and debridement performed by noted orthopaedic surgeon Dr. Lewis Yocum in Los Angeles. During the surgery, Dr. Yocum found no major damage to Lilly's shoulder and the procedure consisted of a washout and clean up of the shoulder. The procedure took approximately one hour to complete. Lilly will immediately begin an aggressive range of motion and strengthening program. After the first of the year, Lilly will be re-evaluated and the club will establish a timetable for him to begin his throwing program in preparation for the 2010 season. Typically, recovery time for a procedure such as this would place Lilly's return to the Cubs rotation within the month of April. "We are pleased that Ted's surgery was a success and are eager to see him begin his rehabilitation program," said Cubs General Manager Jim Hendry. "After Ted's re-evaluation following the first of the year, a determination will be made as to when he will begin his throwing program. At this point in time, it is too early to precisely project Ted's return to the Cubs rotation; most estimates would place that return within the month of April. "At the conclusion of the 2009 season, Cubs team doctors prescribed a conservative approach to managing Ted's shoulder in preparation for the 2010 season and, following a second opinion, Dr. Yocum agreed," Hendry continued. "At the end of last week, Ted decided that undergoing a surgical procedure was the course of action he wanted to pursue, a decision the club supported. We're glad the surgery did not reveal any major damage to Ted's shoulder and look forward to his return to our rotation." Don't shoot the messenger! Here is the latest on Milton Bradley and a possible return to the Texas Rangers where he played in 2008 before he signed with the Cubs. There are a ton of rumors regarding Bradley and where he may end up and most of them are untrue. However, these one appears to at least be up for discussion. Cubs General Manager Jim Hendry will join me tonight on Sports Central at 7:35 for an extended discussion. Hendry has always been very generous with his time and he has agreed to discuss this past season and the upcoming off season. Please post any questions that you have as a comment here on the blog. One request, please keep the questions to current issues with the team. Hendry is not allowed by baseball rules to discuss players on other teams. Also, please keep it clean. I know that Cubs fans are frustrated by the 2009 season but please ask solid questions. Inappropriate comments will be removed. Also, please note that new Cubs hitting coach Rudy Jaramillo will join me at 7:10. Now that the 2009 season has come to an end for the Chicago Cubs it is time to take a critical look at the team and dispel a few ideas that some in town seem to believe as gospel. First, as much as the signing of Milton Bradley was a bad idea it was not the reason the 2009 Cubs finished where they did. Repeat after me, Milton Bradley was not the reason this team is not in the playoffs. Bradley was certainly a problem in the clubhouse and his productivity was not great but there were several other problems that helped derail the season. The fact that the entire starting outfield combined for 43 HR's and 99 RBI's was certainly one reason that the run production was down dramatically from 2008. Add in the fact that Geovany Soto had a brutal year and that Aramis Ramirez only played in 82 games and you have two more huge components of the 2008 offense that did not perform at the same level. The Chicago Cubs have suspended outfielder Milton Bradley for the remainder of the season probably ending his disappointing stay on the north side of Chicago. Bradley has been a moody and problematic presence in the Cubs clubhouse all season long but not until he unloaded his feelings in an interview with the Daily Herald yesterday did the Cubs finally take action. 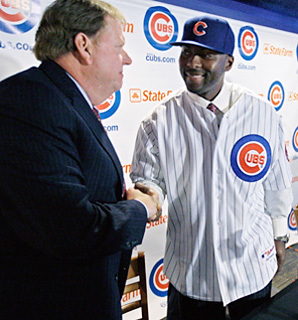 Milton Bradley and Jim Hendry in happier times when he signed with the Cubs. Hendry suspended the outfielder for the remainder of the season today. It is obvious that Bradley won't be returning to the Cubs next season but by suspending him the Cubs have essentially made it even more difficult to deal him this off season. This action should not come as a surprise to anyone because Bradley has been a major problem to deal with most of the season for not only the media but the manager, his coaching staff, the front office, and even his teammates. Rich Harden's inability to pitch deep into games combined with his injury history makes it likely he won't be a Cub in 2010. With the Cubs looking towards next year and trying to figure how to improve their team without having a big budget increase lets take a look at their salary commitments for 2010 and how their payroll may prevent them from making many major moves. Add in to this number arbitration eligible players like Ryan Theriot, Carlos Marmol, Aaron Heilman, Angel Guzman, Sean Marshall, Mike Fontenot, and Koyie Hill and you have to figure that the payroll will swell to approximately $130 million or more and that is just for 16 players. Add in needing to either re-sign or replace Rich Harden, Kevin Gregg, and Reed Johnson and you have a payroll that is close to or more than 140 million BEFORE you attempt to improve the roster. So those of us who like to play arm chair general manager and have the Cubs taking a run at Chone Figgins or another high priced free agent better understand that the Ricketts family is not going to be adding big money to the payroll in their first year of ownership. 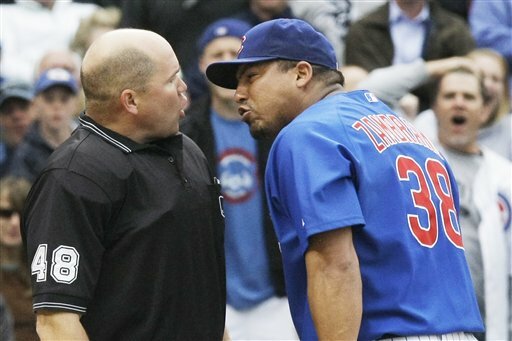 Carlos Zambrano has his share of detractors, but should the Cubs consider trading him this off-season? Paul Sullivan stirred up Cubs Nation over the last 24 hours when he talked about the possibility of the Cubs trading Carlos Zambrano this winter in an attempt to create more payroll flexibility and to add some young prospects to the club. Since his article hit the Internet last night after the Cubs 2-0 win over the Milwaukee Brewers, there has been much discussion about whether or not it makes sense to deal the volatile right hander. Bruce Miles of the Daily Herald thinks it would be foolish to deal Zambrano, because he believes Big Z has pitched much better than his record this season indicates. Zambrano has been heralded as the ace of the Cubs staff for a long time. And while he is paid like an ace he hasn't pitched like one since inking his 91.5 million dollar extension in August 2007. But let's not blame him for his salary. He accepted what the market said he was worth and when the Cubs signed him he did what any one of us would have done, he signed the deal. So don't blame him for that. Now if you want to complain that he is paid like a #1 starter and he isn't a #1 starter, that is an entirely different argument. I have complained that Zambrano doesn't win enough to be an ace. I know that wins are not the best statistic to judge a pitcher on, but the fact that he ranks roughly 30th in baseball in wins since the day he signed his extension is very disconcerting. After considering discussing a deal that would have sent pitcher Rich Harden to the Minnesota Twins earlier in the week Cubs GM Jim Hendry told the Twins that he was not ready to wave the white flag of surrender with his team 5 games out in the NL Wild Card race. The Twins were very interested in acquiring Harden who they looked at as a potential #1 starter in the playoffs and were willing to pay a fair price to land him. However, after seeing Colorado struggle last weekend Hendry decided to go all in and try to make the playoffs rather than dealing one of his best arms. The talks really never got very serious. The White Sox have traded Jim Thome and cash to the Dodgers for minor league infielder Justin Fuller. They have also sent Jose Contreras and cash to the Rockies for right-hander Brandon Hynick. The two deals save the White Sox roughly $3 million in payroll for the rest of the of the 2009 season, (depending on how much cash the Sox gave up) but also give both players a chance to be in a pennant race through the month of September. I'm happy for Jim Thome, as he's one of the good guys in the game today, and handled himself with the utmost class throughout his tenure with the White Sox. With the move to the National League and no designated hitter, it's uncertain whether Thome will get time at first base. If nothing else, Thome can provide Dodgers skipper Joe Torre with a potent left handed stick off the bench. As for Contreras, the White Sox can finally rid themselves of the Cuban right hander, who has had a miserable season, and is a shell of the former dominant pitcher that helped lead the White Sox to the 2005 World Series title. This season Jose was 5-13 with an ERA of 5.42. And a funny Ozzie note: Reporters asked Ozzie Guillen before tonight's game whether Contreras might start Thursday, before rumor of the trade got out. Guillen scoffed at the question and said there'd be no way he'd start Contreras, adding he'd rather send pitching coach Don Cooper to the mound. The deadline is about to expire and I have confirmed from sources close to both sides that the Cubs and Twins could not agree on the players that the Cubs would receive in a Rich Harden deal. 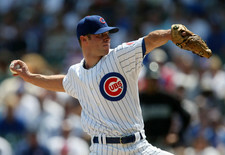 He is scheduled to make his start tonight at Wrigley Field against the Houston Astros. Aaron Heilman will also be staying with the Cubs because they own his rights as he is short of service time for free agency. So having him under their control makes more sense than just giving him away now. With 30 minutes to go before the period to trade both Rich Harden and Aaron Heilman expires it appears that the Twins were unwilling to meet the Cubs asking price of a high level prospect for Harden. The Cubs weighed their chances of making a run in the Wild Card race and having more time to consider all of their options on Harden versus the lower level prospects the Twins were offering and it appears that they are staying put. With 30 minutes to go could Minnesota GM Bill Smith change his mind and make an offer that Jim Hendry just can't refuse? Sure, he could do that but it does not appear likely. Give Hendry credit because he took a stand and refused to settle for something less than he wanted to make the deal. Will he offer salary arbitration to Harden is the next question he has to answer once the season ends. With a noon deadline to complete a trade for both Rich Harden and Aaron Heilman drawing closer, Cubs GM Jim Hendry has been working the phones this morning as he tries to determine the best course of action for his club. Does he trade Harden and/or Heilman for whatever he can get or does he hang onto both guys in the hopes of re-signing them or in the case of Harden offering him salary arbitration to get draft pick compensation if he signs somewhere else? Most of the baseball people that I have spoken with this morning believe that Harden will be traded but that belief is only if the Cubs have decided privately that they would not offer him arbitration for fear that he would accept it and that they could be stuck with a 10+ million dollar salary which they have no interest in paying to a pitcher with his injury history. Ken Rosenthal of Fox Sports has an interesting post up on the Harden situation. In the story he relates a statistic from the folks at Baseball Prospectus who do a daily playoff odds report. They have computed the odds of the Cubs playing in the postseason at just 2.7% so a decision to keep Harden for the rest of this season really makes no sense if you do not plan on either re-signing him or offering him arbitration to get draft pick compensation. The Cubs have until Monday to decide what they want to do with the contracts of Rich Harden and Aaron Heilman who were both claimed on waivers in the past week. Harden was claimed by the Minnesota Twins who are desperate to add starting pitching as they try to catch the Detroit Tigers in the very weak AL Central. Heilman was claimed by the San Francisco Giants who are looking for a relatively inexpensive arm for their bullpen. Rich Harden could be on the move to the Minnesota Twins who claimed him on waivers. Heilman will not bring you much back in return but since he has had such a mediocre season I would try to move him so that you don't have to deal with him going through the arbitration process in the off season. He is not good enough to be a factor in the bullpen of a championship caliber team so why bring him back next season? Harden has some value on the trade market though because he is currently healthy and he can help the Twins as they try to run down Detroit. The Cubs probably will not bring him back due to his injury history and the price he will probably command on the open market. In addition, media reports that continue to say that the Cubs will get two draft picks if Harden signs somewhere else as a free agent at the end of the season are not entirely accurate. To receive draft picks for losing one of your own free agents you have to offer that player salary arbitration. If the Cubs were to offer Harden arbitration there is a strong possibility that he would accept it and that would put the Cubs on the hook for potentially a 10-12 million dollar salary award. To have kept him reasonably healthy enough to make somewhere between 25-30 starts this season is nothing short of a miracle. The front office of the Oakland A's can't believe that Harden is still pitching as they were sure he would have blown out shortly after they traded him to the Cubs in July of 2008. This is one of the things that Cubs pitching coach Larry Rothschild deserves tremendous credit for because no one in baseball thought that the Cubs could keep Harden healthy. However, why push your luck? Trade him now when you have a team in Minnesota who is desperate to add a talented starter for their playoff push. Don't keep him when you probably won't re-sign him and then get nothing for him. If you want to re-sign him as a free agent you can do that in November. Just trade him now and get some young talent from the outstanding Minnesota system. 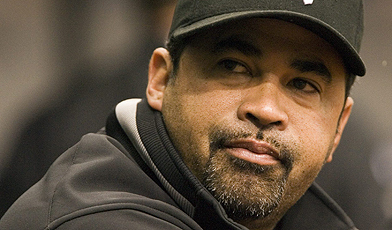 Ozzie Guillen unloaded on his team after today's 10-0 blowout loss to the Yankees in New York. Most managers and coaches wouldn't be so honest but Sox fans love Ozzie's frankness. After the White Sox were blown out 10-0 by the Yankees this afternoon, Sox manager Ozzie Guillen unloaded on his team. Guillen ripped his club's offensive woes and defensive shortcomings in a rant we would never see from too many professional coaches and managers. Whether you like Guillen or not, you have to respect his honesty and the passion he displays while doing his job. He calls it as he sees it and with his team quickly falling from the race in the AL Central and having no shot at the Wild Card, Guillen is making sure his players know just how disappointed in them he is. Looking at the White Sox long term you see some good things to build on for next year, but you also see some major holes in their club. Their rotation is excellent with Mark Buehrle, Gavin Floyd, John Danks, and newcomer Jake Peavy all considered solid to above average starters. Who fills the #5 starter's role is still in question, but how many teams in baseball can say they have excellent arms in the 1-4 slots and have all of them either under contract or under team control for the next few years? The White Sox have a future superstar in Gordon Beckham playing 3B, but should they choose to use Alexei Ramirez in a trade this winter Beckham could slide over to his natural position of SS. The outfield has Carlos Quentin in LF, (and when he is healthy he is among the best in the American League) along with the recently acquired Alex Rios, who is a solid if unspectacular player with excellent athleticism and defensive skills. One more outfield spot remains to be decided upon with the return of RF Jermaine Dye up in the air, as is the return of the surprising Scott Podsednik, who has been outstanding since GM Kenny Williams plucked him off of the scrap heap early in the season. One of these two is expected back, but not both. Paul Konerko has one more year left on his deal and he will be back for another season at first base, as will A.J. Pierzynski behind the plate. At second base the White Sox have Chris Getz penciled in to start next season but if they can find an upgrade they will most certainly consider it. Defensively, this is not a good team. The Sox have to make some tough decisions on how they can improve defensively without tinkering too much with the general makeup of their club. The bullpen is where you will probably see more change than in any other area of the team before next season. I don't believe that closer Bobby Jenks will return because after making $5.6 million in 2009 his salary is expected to jump dramatically which will probably force Kenny Williams to shop him in the off season. Octavio Dotel's contract is up so he will not return, and with Scott Linebrink struggling the Sox will need to find a standout set up man to replace Dotel and to take most of the key appearances away from Linebrink. Matt Thornton is among the best left handed set up men in all of baseball, and will probably get the first shot at the closer's job if Jenks is traded. All in all, the White Sox seem to be in better position going into this off season than their crosstown rival, the Cubs, who have major questions to answer and very little payroll flexibility with which to answer them. One thing the Sox do have going for them is manager Ozzie Guillen who is sure to keep things interesting and to keep the Sox in the headlines with his honesty and fire. The Cubs looked awful Wednesday night and were pounded by the Phillies 12-5 so with 50 games to go lets examine the facts and the questions surrounding the franchise. First of all, the Cardinals now lead the division by four games and after adding Matt Holliday and Mark DeRosa they have become a much more formidable opponent than they were when the season began. Let's look at the roster and discuss the situation the Cubs have put themselves in. First of all, manager Lou Piniella will be entering the final year of his contract in 2010. This season appears to be weighing on him heavily and rightly so. Sweet Lou came here to end a century of futility and as of now the picture for 2010 does not look pretty based on how his club is currently constructed and how they are playing. Will he want to return? Three million dollars is a lot to walk away from but Lou is 66 years old and he should be financially set for the rest of his life so is his happiness worth more than the money that he would earn in 2010? Does he have the energy to go into next season knowing how much work lays ahead of him to turn around his club? He told me as recently as two weeks ago that he was definitely returning and that the fire burns inside of him to lead the Cubs to the title. However, with the team's ownership still up in the air and a number of big contracts to underperforming stars appearing to be diificult to move will Piniella reconsider his plan to manage the Cubs next season? The Cubs braintrust of GM Jim Hendry and manager Lou Piniella will have a lot of tough decisions to make this winter. If he does walk away who would the Cubs hire as their field manager? Joe Girardi who desperately wanted the job and was the choice of many fans when Piniella was hired over him in 2006 is now the manager of the New York Yankees and has a club that may win the World Series this season. He is also under contract for another year so that would appear to rule him out. Ryne Sandberg is currently managing in the Cubs minor league system but would the Cubs risk hiring a manager who has never done the job at the major league level before? He certainly knows the system and was a Hall of Fame level player but that does not guarantee success as a manager. All in all, if Piniella leaves the decision on who to replace him with will not be an easy one. I am so sick of hearing that Carlos Zambrano is the "ace" of the Cubs staff and that he is considered one of the best starters in the baseball. That is such a pile of garbage and it is about time people start to call this guy what he really is, a fraud. Zambrano is not a big game pitcher, he is not an ace, and if the Cubs can, I believe they will look to move him and his bloated contract out of Chicago as soon as possible. What qualities does a #1 starter have? How about piling up wins? 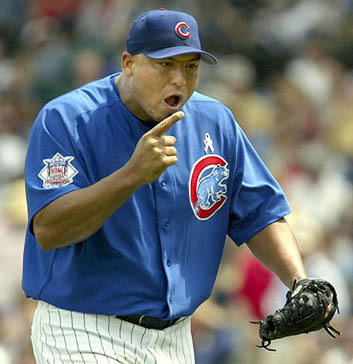 Zambrano has averaged 14 wins a season since he became a full time starter in 2003. Does he play the role of leader on the club? Don't make me laugh. He is immature, doesn't work as hard as the Cubs would like, and he is not what one would consider a big game pitcher. Many times Zambrano has had a chance to stop a losing streak or to win a big game and he has failed a majority of those times. It's time for the Cubs to find a way to move Carlos Zambrano and his antics out of Chicago and find a #1 starter who actually is an ace. The facts don't lie. The Cubs are paying for top flight performance from a pitcher who has the skills to be a big winner. However, Zambrano's performance does not warrant such a big contract and his 18 million dollar annual salary is one of the deals that is limiting financial flexibility for the front office. Talk to the scouts that attend every game the Cubs play and they all bemoan his incredible physical talents and lack of productivity for a guy whose reputation is that of a superstar. Zambrano has won all of 7 games this season. That's it. He has had incidents with a Gatorade machine, been suspended for his outburst towards a home plate umpire, and has had two stints on the disabled list. Seven wins for 18 million dollars and enough headaches for management to drive them crazy. Check out Zambrano's contract terms and you will see that the Cubs have done their part in paying him to be a star. He has not lived up to his end of the bargain though and he has no one to blame but himself. He cannot control his temper and those who observe his antics on a day to day basis know he is far from the superstar pitcher that some believe he is. Perhaps his back is injured this time. Maybe he truly needs to be on the DL and will be gone for an extended period of time. That may be true but it still does not explain his lack of emotional control and his startlingly poor productivity in big games. In four post season series Zambrano is 0-2 with an ERA of 4.34. He has won 18 games once (18-13 in 2007) and 16 twice. That's it. No 20 win seasons, no Cy Young Awards, a grand total of 8 complete games in 9 total seasons in the big leagues. He may be a #2-3 starter on a good team but to pay him as a #1 is ridiculous. It is time for the Cubs to find a taker for the antics and the talents of Carlos Zambrano. I know that he has a no trade clause but perhaps Zambrano would also like a fresh start in a new city. He may have a golden arm but we have seen far too many other "qualities" from the man they call "Big Z" to call him an ace or a reliable starter on a team with championship aspirations. Pack your bags Carlos, it's time to take your act to another team. We've tired of you and your immaturity. While everyone seems to be full of excitement over the Cubs play since the All Star Break we need to temper our enthusiasm until the Boys in Blue show us a bit more. The Cubs record since the break is a very solid 14-6 and they have hit the ball very well in addition to getting excellent pitching from their starters. However, look beyond the record and there are a ton of questions that need to be answered positively before we can get all giggly as Lou Piniella likes to say. First, can this team win against the better teams in the National League? The 14 wins have come against Washington (4-0), Cincinnati (5 of 6), and Houston (3 of 4). Those are not exactly great teams with Washington and Cincy among the worst in all of baseball. The two series that the Cubs have played against good teams have been Philadelphia where they lost 2 of 3 and Florida where they also lost 2 of 3. In addition, the bullpen has been less than stellar with closer Kevin Gregg blowing two straight saves in Florida and ace set up man Carlos Marmol continuing to struggle with his command and letting teams back into games when he needs to slam the door. Milton Bradley continues to struggle from the left side of the plate which is a problem when the majority of starters that the Cubs face are right handed. Geovany Soto has to prove he can return in a big way from a lengthy stint on the DL which is no small feat considering he was hitting .230 when he was injured. Reed Johnson is a big part of the Cubs but will he come back successfully from a broken foot? What about Ted Lilly who is currently on the DL with shoulder tendinitis and just had arthroscopic knee surgery? Kevin Gregg had a rough weekend serving up home runs to his former team, the Florida Marlins and costing the Cubs a big win and a return to first place. Many times when a baseball team struggles you hear the expression, "relax it's early" or "it's a marathon not a sprint" but after the all star break it is no longer early and with just 59 games remaining it is indeed a sprint. This weekend was a lost one for the Chicago Cubs as they dropped two of three games to the Florida Marlins and could have very easily been swept. They also could have won two of three just as easily if their bullpen didn't put up a couple of horrific performances. Friday evening the Cubs received a solid start from Rich Harden only to see the bullpen implode in the 8th inning with Carlos Marmol starting the inning off by walking the first two hitters and then hitting a man. He nearly escaped any damage by getting the next two men before giving up a game winning single. 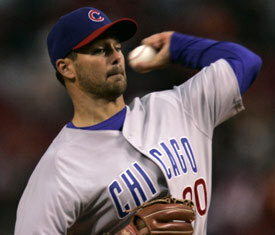 Sean Marshall then entered and allowed a double to Wes Helms that plated two more and the Cubs lost 5-2. Cubs GM Jim Hendry spent all day Friday discussing possible scenarios with other General Managers but in the end the price to add a bench player was too high to part with solid prospects from the Cubs rapidly improving system. Sam Fuld will be officially recalled from Class AAA in time for tonight's game and will take Reed Johnson's place in the outfield rotation. Tom Gorzelanny is meeting the team in Florida where he will throw for Cubs pitching coach Larry Rothschild. He is on the Class AAA Iowa roster but should the need arise he could start Tuesday against the Reds in Cincinnati. Down on the Farm....A major league scout who I have known for several years regularly covers the minor leagues and told me today that he believes that the Cubs system is vastly underrated and he points to the hiring of Tim Wilken as scouting director as one of the most important additions that Jim Hendry has made during his tenure as GM. He specifically mentioned Josh Vitters as the 2nd best hitter he has ever seen come out of the Class A Midwest League (the best being Albert Pujols) and he was raving about SS Starlin Castro who was the MVP of the Florida State League All Star game after going 4-4. He projects Castro as a future major league 2B and puts Hak Ju Lee another shortstop prospect as a future star and a top of the order hitter. Lee is hitting .340 in Boise this summer and is just 18 years old. One other name that he mentioned was pitcher Andrew Cashner who is making the transition from reliever to starter. He says he believes the hard throwing Cashner will be in the big leagues at some point next season. The White Sox may have waited until just before the deadline to make a move but when they did they made sure it was a BIG MOVE as GM Kenny Williams has acquired starting pitcher Jake Peavy from the San Diego Padres. Headed west are pitchers Clayton Richard, Aaron Poreda, Adam Russell, and Dexter Carter. Peavy, who was traded earlier in the season to the Sox and chose not to waive his no-trade clause at that time has signed off on the deal this time. Williams has long coveted Peavy and by teaming him with Mark Buehrle the White Sox have a tremendous 1-2 punch going forward from Opening Day 2010 and beyond. Peavy has been sidelined with an ankle injury since June 9th and his availability for the remainder of this season is still up in the air. Had he remained in San Diego he was expected to be shut down for the rest of this season. Peavy's agent, Barry Axelrod told me just a few minutes ago that Jake is still hoping to pitch this season and that he just received a great report on his injured ankle from his doctor. He will begin throwing off of a mound possibly tomorrow and could be a tremendous stretch run addition should the White Sox stay in the race until he is ready to return which could be by September 1st. General manager Jim Hendry has been burning up the phone lines over the past 24 hours and it has paid off for the Cubs pitching staff as John Grabow and Tom Gorzelanny have both been traded to the Cubs for starting pitcher Kevin Hart, reliever Jose Ascanio, and minor league infielder Josh Harrison who is at High A Daytona and is hitting .286 through his first 18 games there. He hit very well at Low A Peoria before a recent promotion. Harrison is not considered a "tools guy", but rather a polished baseball player who projects as utility man with a solid bat according to Kevin Goldstein of Baseball Prospectus. The deal makes sense for the Cubs because there are many around baseball who feel that Hart has maxed out his performance and that he will never be a big time starter. In addition, Ascanio is a hard throwing bullpen arm who should thrive in the Pirates pen because there isn't much competition down there for the setup role. Harrison is a decent player but is not considered an elite prospect. The Cubs are trying improve their pitching staff from the left side in a big way today and are trying to finalize a deal to add both setup man John Grabow and starting pitcher Tom Gorzelanny from the Pittsburgh Pirates. Here is the latest from the Pirates beat writer who travels with the team and always has excellent information. The deal is not yet done but GM Jim Hendry has considerable interest in both players to strengthen a pitching staff that has had to deal with an injury to Ted Lilly who is one of the most consistent members of the Cubs rotation. Grabow fits as a situational lefty while Gorzelanny has a solid track record as a starter but is currently pitching in Class AAA for the Pirates. from his best season in 2007 shows a guy who pitched 200+ innings and made 32 starts for a team that was never in the pennant race. He has struggled since then but there are scouts who feel that a change of scenery could be just what he needs to return to form. provides a word of caution because this season right handed hitters are hitting just .234 while left handed hitters are at a .275 clip which evokes memories of Mike Remlinger who was much better against righties than he was against lefties during his entire tenure with the Cubs. Should the deal go through it strengthens the pitching staff because it gives Lou Piniella depth from the left side and if Gorzelanny is included it provides another option as a starter if Lilly has any lingering issues from his DL stay. The deadline is 3 p.m. tomorrow so there is still plenty of time for Hendry to add another left handed bat which Piniella would like to have. Reed Johnson Goes Down...What's Next for Jim Hendry? With Reed Johnson going on the DL with a broken foot, the Cubs have to make a move tomorrow to take his spot on the roster. What will GM Jim Hendry do? And will Johnson's injury change his priorities in advance of Friday's non waiver trade deadline? I believe that the Cubs will probably add another arm to take some of the heat off of their bullpen for a day or two and that arm will probably be Jeff Stevens who was just optioned to Class AAA Iowa on Wednesday. He was sent out because he had pitched enough over the past few days that he was unavailable if Lou Piniella had needed him on Wednesday. Thus, he went back and Mitch Atkins came up. Normally a player has to stay in the minors for 10 days when he is optioned out, but that rule does not apply if he is recalled because of an injury. Look for Hendry and Piniella to add another arm for a day or two and then they will add another outfielder to the mix, most probably Sam Fuld who played very well in limited action in two earlier stints this season with the Cubs. The trade deadline is Friday and while Hendry would love to add a Reed Johnson type of player, guys like him don't just grow on trees. Whoever Hendry adds has to be able to play CF. Fuld can most certainly do that, but he doesn't hit from the right side. So if that is a concern for Lou Piniella, Hendry can consider some other options via trade. The non-waiver trade deadline is 3 p.m. CST on Friday and it has been a fairly quiet week so far devoid of the flurry of activity that some in the industry expected. Both the Cubs and the White Sox are looking to make additions to their teams but only if the cost is not exorbitant in both money and prospects given up. The White Sox are better positioned to make a major move because of the stability of Jerry Reinsdorf as the owner and the financial flexibility that they have after this season. They have millions of dollars coming off of the books after 2009 and as evidenced by their aggressive pursuit of Jake Peavy, Kenny Williams is willing to move if the deal makes sense long term. Yesterday's trade for Mark Kotsay of the Boston Red Sox was a minor deal but Williams may not be done. He is kicking the tires on adding a big name starting pitcher but only if Gordon Beckham's name is not part of the deal. He is considered an untouchable by the organization. The Cubs are looking to add a bullpen arm, preferably from the left side but will not trade one of the top five prospects in their system to add a player who is not a prime time addition. That would seem to take them out of the running for Baltimore closer George Sherrill, who is very tough on left handed hitters and has closing experience. The veteran will be tough to land though because of the price that Orioles president Andy MacPhail has hung on him. So this afternoon Steve Stone sends out a Tweet on his baseballstone@twitter account saying that the Tigers are interested in Cubs RF Milton Bradley. I hear from a baseball agent who says the same thing and then after Stone's post hits the internet and I put the rumor on my blog all hell breaks loose. So let's review what I posted this afternoon. The headline of the post says "Can it be? Are the Tigers after Milton Bradley? The post talks about the rumor and ends this way: I will be working my baseball sources for more on this rumor but if it is indeed true the Cubs need to make that deal ASAP! So from that post and Stone's Twitter everyone jumps to the conclusion that the deal is imminent. After talking with various people around the Cubs and Tigers we find out that the deal is simply just a rumor and is not going to happen. In fact, Stone even Tweeted from Detroit that Tigers GM Dave Dombrowski said he wouldn't want Bradley on his team. So how did a rumor which happens all of the time take off so quickly? Perhaps because people are so desperate to see Bradley in another uniform they ran with a rumor that it turned out had no substance to it. Whatever the reason is it really doesn't matter. The Tigers aren't interested in trading for Milton Bradley and it appears he will be the Cubs RF for the forseeable future. Can it Be? Are the Tigers After Milton Bradley? Two very solid baseball sources confirmed for me just moments ago that the Detroit Tigers are interested in Cubs RF Milton Bradley. They believe that Bradley would be a much better fit as a DH than as a right fielder and that he would mesh well with Tigers manager Jim Leyland. Both sources say that the Tigers have scouted Bradley and are interested depending on how much of his contract the Cubs are willing to eat. Here is the remaining money left on Bradley's deal which depending on certain clauses has two more years left on it. 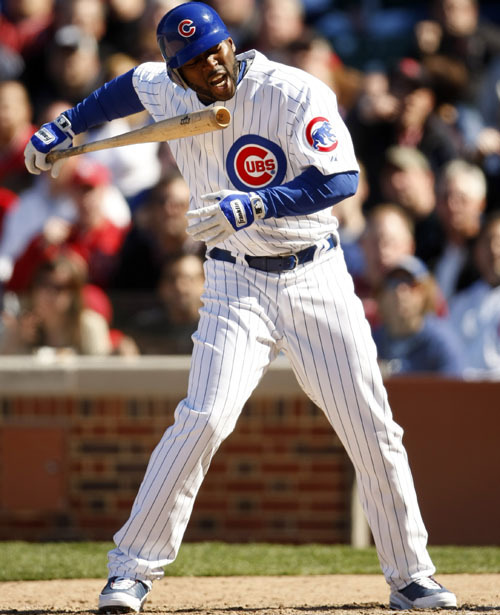 Milton Bradley has had a very frustrating season so far in a Cubs uniform. Could he be wearing a Tigers jersey soon? I believe that Bradley is a much better player than he has shown so far during his brief time in a Cubs uniform but I also believe that the Cubs would be better off trading him and starting over in right field. If he is moved it opens up all sorts of possibilities because then Lou Piniella could put Kosuke Fukudome back in his natural position of RF and platoon Sam Fuld and Reed Johnson in center. The Cubs could also make a run at Nationals outfielder Adam Dunn who is putting up big numbers on a last place team and is on the trading block but one scout who is here at the game today just told me that he would never want Dunn on his team because he does not think he is a winning type of player. He also told me that the Red Sox passed on signing Dunn because they were concerned how he would fit in the high pressure environment of Boston. The scout also said that defensively Dunn would be a horrific fit in right field at Wrigley. I will be working my baseball sources for more on this rumor but if it is indeed true the Cubs need to make that deal ASAP! Yesterday I posted a list of starting pitchers who will be free agents at the end of the 2009 season and with Ted Lilly on the DL the Cubs will have to move quickly to either add a starting pitcher or to add a couple of bullpen arms and move Sean Marshall into the rotation. Lilly is being disabled because of tendinitis in his throwing shoulder but he will also have arthroscopic knee surgery on Monday to clean up a problem that has caused him discomfort for a while. He is expected to be sidelined for approximately three weeks. Ted Lilly's shoulder injury may force the Cubs to add another starter in addition to bullpen help before Friday's non-waiver trade deadline. Here is a list of relievers who will be free agents at the end of the 2009 season. Some of these names will be of no interest to the Cubs and some will be unavailable for various reasons. 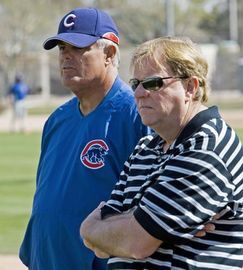 However, regardless of how difficult the task might be to accomplish Cubs General Manager Jim Hendry has to find a way to upgrade his bullpen so that he gives Lou Piniella the ability to mix and match down the stretch of tight ball games. In addition, if Lilly is gone for an extended amount of time that could severely hamstring the starting rotation and force Hendry to have to add another starter. Forget about Roy Halladay because the Cubs don't have the package of players necessary to get him from Toronto plus with the ownership situation so unsettled they cannot take on the type of money that Halladay makes and will make in the future. Two names on the Arizona roster that could have great appeal to Hendry are reliever Chad Qualls and former White Sox starter Jon Garland who is a former #1 draft pick of the Cubs. Qualls is in high demand from most of the teams in contention but Garland, while not a top of the rotation guy could be serviceable in Lilly's absence. He also has a very manageable contract that is up at the end of this season and contains a mutual option for 2010. Should Hendry choose just to upgrade his bullpen he needs to give Piniella at least one solid lefty that can be used against the elite left handed hitters the Cubs will face the rest of the season. Three lefty's that can be had without giving up a ton in return are Joe Beimel of the Washington Nationals, John Grabow of the Pittsburgh Pirates, and former Cub Scott Downs who is pitching for the Toronto Blue Jays. Downs is a fairly attractive option but Toronto GM J.P. Ricciardi has been telling other general managers that he wants to get the Roy Halladay deal done before he looks at other moves. Pitching coach Larry Rothschild has rearranged the starting rotation to compensate for the loss of Lilly by moving Kevin Hart up to start today's game, Rich Harden goes tomorrow, Carlos Zambrano goes Monday night, and Ryan Dempster returns from the DL on Tuesday evening. Randy Wells will pitch Wednesday and Kevin Hart will conclude the homestand on Thursday afternoon against the Astros. SIGHT SEEN....Carlos Zambrano and many of the Cubs pitchers took part in their pre game running from foul line to foul line accompanied by Zambrano's new dog, "Little Z" who is a Sharpei that is 10 weeks old. The dog was a big hit in the clubhouse before the game, especially when Zambrano dressed the dog in a t-shirt and hat. Lilly to the DL....Now what Should Jim Hendry Do? The 2009 Cubs have dealt with injuries on a much larger scale than those that the 2007 or 2008 division winning clubs did combined. With today's news that All Star starter Ted Lilly is headed to the disabled list with shoulder problems GM Jim Hendry's priorities with the trade deadline just 7 days away may have been dramatically changed. This list is courtesy of Cot's baseball contracts and the complete list of free agents can be found here. So, what would you buy with limited dollars and needs in the bullpen, on offense, and possibly now in the rotation? I'd love your thoughts for my trade deadline show that will air next week on Sports Central on WGN Radio. MLB sources confirmed to me this morning that meetings between the Ricketts family and Tribune Co. are ongoing to try to finalize the sale of the Cubs. However, it appears that the transaction will not be formally completed for quite a while. Tom Ricketts has been in New York meeting with MLB officials as well as with banks involved in financing the deal. However, the transaction is so complex that it is taking much longer to finish than was once expected. It is still believed to be on track to head to the bankruptcy court for approval but there are still several steps to complete before that hurdle is reached. Don't look for Tom Ricketts to be in a position of saying yes or no to a major trade acquisition by the July 31 non waiver trade deadline. Until the deal is in the hands of baseball's other owners Ricketts does not have authority to get involved in management decisions. However, you can bet that the Cubs will not take on a large amount of payroll without someone who would be responsible for the money owed down the road saying yes or no. The Utay group has not been formally told they are out which is smart business by the Tribune Co. because should anything fall through with the Ricketts family they have to have a backup plan. But a very good source in baseball told me this morning that he would be stunned if the Ricketts deal fell through. Tom Ricketts is trying to bring the deal to completion and will not be too worried about things going on with the club until he is formally handed control. We will update this story tonight on Sports Central. Published in Cubs, Cubs Sale, MLB, Trades and tagged Chicago Cubs, Tom Ricketts, Tribune Co. The Cubs are getting ready to play game two of their four game series against the St. Louis Cardinals at 3:05 and they have just completed batting practice at the Friendly Confines. After looking at the numbers, past history and trends I am ready to make a prediction on today's game. Look for Alfonso Soriano to have a big day as he is starting to square the ball up better and I have a feeling that he will hit very well against Cardinals starter Brad Thompson. I have been very critical of Soriano who is mired in a horrific slump but if this Cubs team is going to turn things around and make a run at another playoff appearance he must hit well. I have Soriano getting three hits and taking one out of the ballpark as the Cubs will win 6-2. 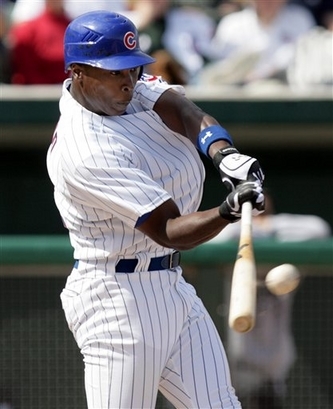 Can Alfonso Soriano have a strong second half and lead the Cubs back to the playoffs? Also, if you missed the news Sam Fuld has been recalled to take Geovany Soto's roster spot as he has been placed on the 15 day DL with an oblique strain. GM Jim Hendry is also actively looking to add a backup catcher who is solid defensively. His offensive skills are not as much of a priority but he has to be able to call a game and throw enough to discourage a team from running on him with reckless abandon. For a Canadian and die hard hockey fan you have to think that Ryan Dempster has jumped over the boards before. What happened here? Check out the young Cubs fan who sure found it funny before he knew Dempster was injured. Ryan Dempster's injury could cause real problems for the Cubs if he is out as much as 5 weeks which some folks around the Cubs are fearing. Kevin Hart pitched okay in yesterday's loss to the Braves but while Atlanta scored only 1 run in 5 innings off of him and only had 4 hits he did walk 5 which will be unacceptable against the better offensive teams the Cubs still have left on their schedule. I know Dempster's injury was a freak thing but he has to be smarter than that knowing how important he is to the club. He was a 17 game winner a year ago and he is one of the leaders of this club off the field and to have him out really hamstrings the pitching staff. If Hart is not able to adequately fill in then the next option is Sean Marshall which would leave the Cubs with exactly no left handed set up man to use in a key situation in the latter innings of a close ballgame. The Cubs have traded infielder Ryan Freel to the Kansas City Royals for a player to be named later. Freel was designated for assignment on July 2nd when Jeff Baker was acquired from Colorado. In 14 games with the Cubs he batted .143 (4 for 28) with one run scored and one RBI. He was originally acquired from the Baltimore Orioles for outfielder Joey Gathright on May 8. In working the Internet this afternoon I came across an interesting article. Could the Mets seriously have interest in trading for Milton Bradley? If I was an owner and my GM came to me about approving a deal for Bradley I would tell him absolutely not. I would not want a guy like Milton Bradley on my roster at any cost. However, according to the article, Omar Minaya, the GM of the Mets, wants to add another bat to his team and with the health of Carlos Beltran in question and not much available without parting with their best prospects, Bradley could be on their radar screen. Cubs Notes....Reliever Jose Ascanio has been sent back to Class AAA Iowa and right hander Jeff Samardzija has been recalled.....Sports Illustrated has come out with a poll of 380 major leaguers who were asked: What manager would you least like to play for? Lou Piniella came in first with 26% , Ozzie Guillen was second with 21%, Tony La Russa was third. With Aramis Ramirez headed out on a rehab assignment on Thursday and looking to return to the Cubs everyday lineup next Monday it should change GM Jim Hendry's needs as the front office determines what moves they need to make before the July 31st trading deadline. Do you add a utility type player who can fill in both in the infield and the outfield? Do you look to add a player who could potentially play everyday somewhere? What about improving the pitching staff? Yes, I am as frustrated as anyone by the performance of the Cubs this season but we do need to keep their performance so far in perspective. After today's 6-5 loss to the Detroit Tigers their record is 34-35 but that lackluster performance has them just 1 game out in the loss column and just 3 1/2 games out in the NL Central. The blame for the Cubs poor play has to fall squarely on the shoulders of Alfonso Soriano, Milton Bradley, Geovany Soto, and the rest of the offense that has woefully underperformed. By giving some of his stars a night off Lou Piniella is looking at the big picture down the road rather than worrying about winning the smaller battles. With Alfonso Soriano dealing with a troublesome knee he was given Monday off entirely and Milton Bradley was limited to just a pinch hitting appearance. However, the Cubs couldn't get to Atlanta starter Javier Vasquez who scattered a ton of hits but surrendered nary a run in a 2-0 Braves victory. In looking at this team and evaluating their off season moves it is becoming obvious that to this point in the season not much from the winter has gone right. The signing of Bradley has been a dismal failure so far as has the signing of Aaron Miles and the trading of Mark DeRosa. Letting Kerry Wood leave via free agency has not been the problem that many thought it might be but Kevin Gregg is far from a lock down closer himself. One move that is flying under the radar is the decision to let Casey McGehee go. He is playing well in a backup role in Milwaukee and he could have been a solid insurance policy for Aramis Ramirez at third base. Jim Hendry thought McGehee had a slow bat and elected to get rid of him despite Lou Piniella wanting him to have a spot on the roster. McGehee is hitting .349 for the Brewers in limited duty but he would have been a far better option at the hot corner than Mike Fontenot has been, especially offensively. The trade of Jason Marquis looks worse every day that he keeps winning for the Rockies as he currently leads the National League in wins with 9. Whether he can keep that pace up remains to be seen but when you pay roughly 5 million dollars to get rid of him, and you have nothing on your roster to show for that move, (after the release of Luis Vizcaino) that is a problem. Hendry has won three division titles in his six full seasons on the job and he has obviously made some tremendous moves. But if this Cubs team doesn't kick it into gear soon the winter leading into 2009 will not be looked at as a successful one. The Cubs are Reportedly Considering Pedro Martinez. Why? The Boston Globe reported late Thursday that the Cubs and Rays both scouted Pedro Martinez at a throwing session he had in the Dominican Republic. Why would the Cubs want to spend the few available dollars that they have to spend on an aging starting pitcher? Their rotation leads the major leagues in ERA and their offense is struggling mightily. Take the cash and try to find a player that can multiple positions, play third until Aramis Ramirez comes off of the DL, and can drive in some runs on an offensively starved team. Oh, wait we had that guy....his name is Mark DeRosa. Could the Cubs Sale Process be Re-Opened? I spoke with several sources today regarding the sale of the Cubs to the Ricketts family. There are some people who believe that the process is so bogged down between the two sides that the process could start over with other ownership groups given a chance to try to strike a deal. However, a very well placed source who I spoke with this afternoon told me that he believes that one of two things will probably happen over the next 30-60 days. Either the terms of the sale will be agreed to promptly and it will then head to the bankruptcy court for their clearance before Major League Baseball gives their approval or the creditors of the Tribune Company could assume control of the company. If that happens then the creditors can either keep Sam Zell and his management team in place while they call the shots on the day to day operations of the company or they can remove Zell and his team and run the company with their own people. Should that happen then you might see the sale price of the team go down as the creditors look to get what they can so that they are not forced to run a baseball team that they know nothing about. Whatever happens, it appears according to the baseball sources I spoke with today that there is no chance the team will make a marquee acquisition before the July 31 trade deadline. There could be a tweak here or there but forget about Jake Peavy or another big ticket item calling Wrigley Field their home. That means guys like Alfonso Soriano, Milton Bradley, and Geovany Soto had better pick it up and Aramis Ramirez' shoulder has to return to full strength so that the Cubs have his clutch bat in the middle of their lineup. While the Cubs would love to be active participants at the July trade deadline it appears that they will be forced to play a much smaller role than they might want because of the ownership situation which has pretty much tied GM Jim Hendry's hands. Look for the Cubs to try to acquire a bullpen arm or two with finding a situational lefty a priority. As for adding another bat that appears to be a tougher thing to fit into the budget although two Major League sources told me that there have been some discussions about Mark DeRosa but for that to happen the Cubs would have to move significant young talent to Cleveland and be willing to admit that they made a mistake when they traded him away. Personally, I think the smartest thing Jim Hendry could do would be to trade for DeRosa and add a lefty out of the pen. DeRosa's addition would energize the club and give Lou Piniella some flexibility both in the infield and on the outfield corners. He would also be a great presence in the clubhouse and that can never be underestimated. As for a left-handed reliever, Hendry wants a guy who has a proven track record against left handed hitters and would settle for a guy who Lou Piniella would probably only use for one or two hitters a night. He already has Sean Marshall who can face multiple hitters and pitch significant innings but he is craving a solid situational LH pitcher. Sweet Lou will be smiling if his offense can find a way to produce more than they have so far in 2009. The Cubs head into an off day after winning two out of three games in Cincinnati over the weekend. While winning a series is key the club has to be looking back at Saturday's loss knowing they let a chance for a sweep get away. How much longer can Jim Hendry go without adding a significant bat to the lineup and if you add one where do you play him? A year ago the Cubs were considered one of the best teams in baseball and rolled to a 97 win regular season before their three game implosion to the Dodgers. A year later the lineup looks radically different in terms of productivity and I wonder if you gave the other GM's of any team in contention a chance to add any position player the Cubs have to their everyday lineup just who they would want. Uh Oh ... Could Mark DeRosa be Headed to the Cardinals? 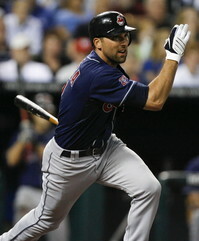 The Cleveland Indians have had ex-Cub Mark DeRosa on the trading block for the past couple of weeks as he will be a free agent at the end of the 2009 season and they have no intention of re-signing him to a new contract. While he would look great in a Cubs uniform especially with Aramis Ramirez on the DL for at least another month don't expect that deal to happen because the Cubs have zero room to add salary until their ownership situation is resolved. Check this story out from the Indians website which is sure to send shivers up the spine of Cubs fans everywhere. The thought of Mark DeRosa playing for the arch rival Cardinals and driving in runs against the Cubs could make a Cubs-Cardinals series an even more intense experience than it already is. Here's hoping that Jim Hendry is given the greenlight to make a few moves to upgrade the club over the next 4-6 weeks which should coincide with Ramirez's return and give the Cubs a real shot in the arm as they head into the second half of the season. Roy Oswalt Says No To White Sox, But Guess Who He'd Say Yes To? This just in from the Houston Chronicle! Star hurler Roy Oswalt said no thanks to a potential trade to the White Sox but he did say to the media tonight that he would approve a trade to the Cubs! More to come on this developing story! Lost among all of the feel good stories being written about the Blackhawks great run in the Stanley Cup playoffs is the fact that the franchise has some serious salary cap problems that must be addressed immediately. After the 2010 season is concluded the Hawks will have to address new contracts for Jonathan Toews, Patrick Kane, and Duncan Keith. Figuring that each player will land a deal worth a minimum of 6 million dollars per season puts the Hawks in a tough spot concerning the hard salary cap that the NHL instituted a few years ago. Figure a minimum of 18 million for those three, 7.2 million per year for Brian Campbell (he signed a huge deal in the summer of 2008), Patrick Sharp (3.9), Dustin Byfuglien (3.0), Brent Seabrook (3.5), and Cristobal Huet (5.625). Add that up and you have spent approximately 42 million dollars for just 8 players. The salary cap is projected to be around 56 million dollars or less in 2010-11 which means that the Hawks will have roughly 14 million dollars to spend on 15 players. Add in the fact that you will have to re-sign Dave Bolland, Kris Versteeg, Cam Barker, and a handful of others and you can see that a big name who is currently on the roster won't be here after next season. The Hawks are in better position for next season salary wise and that is why they are trying to re-sign Martin Havlat and are considering a short term offer to Nikolai Habibulin when the team could add some salary to make a run at the Stanley Cup by adding some high priced veterans on 1 year deals. The problems are not here yet but they are right around the corner so look for GM Dale Tallon to make a proactive move by shedding some salary this summer to put his franchise in a better position for the future. Let's see....where should I start? The Zambrano meltdown? The Blackhawks elimination from the Stanley Cup playoffs? Derrick Rose's name being linked to an NCAA scandal at Memphis? The Jake Peavy rumors that continue to link both Chicago teams to the superstar pitcher? Let's start with the Derrick Rose story that was broken by the Memphis Commercial Appeal newspaper. The Cubs made several roster moves today in an effort at jump starting the club after they snapped an 8 game losing streak in a rain shortened affair at Wrigley Field last night. Sent down were pitcher Neal Cotts and infielder Bobby Scales and IF Aaron Miles was placed on the 15-day DL. Recalled were SS Andres Blanco, LH reliever Jason Waddell, and hitting star Jake Fox who was hitting .423 in Class AAA. My sources tell me that Hendry continues to scour the major leagues for a trade that could solidify third base with Aramis Ramirez gone for probably another 4 weeks. Aubrey Huff of the Baltimore Orioles is a player who is available and could fill in at other spots when Ramirez returns. He has more RBI's than anyone on the Cubs roster and his bat would be a welcome addition to a team that has struggled to score runs. Look for Jake Fox to get a solid opportunity to earn a spot in the libeup and he immediately paid dividends with a ringing double in the 8th inning of today's win over the Pirates. Ryan Freel pulled his hamstring today and he looks like a candidate for the DL. That probably means Bobby Scales is headed back to Chicago to take Freel's spot on the roster. Also, talk around the major leagues is that Mark DeRosa is definitely being made available by the Indians and that the Brewers have some interest if they cannot fill Rickie Weeks position internally over the next couple of weeks. 8 Losses in a Row? Is a Trade Coming? With their 8th loss in a row now in the books panic is starting to creep into the Cubs clubhouse. While all involved agree that the Cubs have a lot of talent on the roster it is also evident that this is a team that has some glaring weaknesses. First, defensively they are less than adequate. They have no legitimate, everday 2nd baseman on a championship level club. They are trying to fill in at 3rd with either a player who is too short to play the position (Fontenot and Miles), a player who the Baltimore Orioles so wanted to get rid of that Andy MacPhail is paying ALL of Ryan Freel's salary, or a player who as of a month ago had never played in the big leagues - Bobby Scales. The bullpen is a huge problem as the Cubs really have only 1 lockdown reliever in Carlos Marmol, a youngster who is getting better in Angel Guzman, and very mediocre pitchers in setup man Aaron Heilman and closer Kevin Gregg. Neal Cotts does not belong on this team nor does David Patton who may be solid down the road but currently is far too inexperienced to be forced to help a subpar bullpen. While much of the trade talk in the media has centered on Jake Peavy who wants to pitch for the Cubs the prudent thing to do would be to add a bat and at least one bullpen arm. I wonder what it would take to re-acquire Mark DeRosa and struggling closer Kerry Wood from Cleveland who is in last place in the AL Central. DeRosa gives you another bat, a clubhouse presence and something that the Cubs sorely need, a 3rd baseman until Aramis Ramirez comes back. Wood, while he has had his struggles returns to a more comfortable setting and could give the club a shot in the arm and change the locker room dynamic. Major League sources tell me that GM Jim Hendry is desperately looking to add a hitter and is calling around both leagues with a real sense of urgency. Oakland's Matt Holliday is available but he is a LF so if you add him that means that Alfonso Soriano must move to 2nd base and that would weaken an already suspect Cubs defense. I would call Texas and see if I could add SS Omar Vizquel and I would move Ryan Theriot to 2b where he could be an all star. Vizquel improves the team's defense and that should help relax the pitching staff. Then I would call Cleveland and beg them to trade me DeRosa. Two other names that are rumored to interest Hendry are the Florida Marlins Dan Uggla and Jorge Cantu. Both are excellent hitters but Cantu has had his struggles at both 2b and 3b before moving to 1b this season. Uggla is coming off of back to back excellent offensive season with 30+ HR's in 2008 but he is hitting just .205 so far in 09'. Whatever Hendry does it is sure to be interesting over the next couple of weeks but whatever he does he better do it quickly before his team's season slips away. While there is still no resolution on the proposed Jake Peavy deal to the White Sox there are several interesting factors at play here that must be considered as to why Peavy wouldn't approve the trade. First, Peavy knows that the National League is easier to pitch in than the American League. There's no DH in the NL, he has a comfort zone knowing the hitters and the teams, and he holds all the cards. He has a no trade clause for a reason. He gets to determine where he will play, period! I spoke with his agent, Barry Axelrod regarding the deal and he told me that Jake wants to pitch in the NL and he is in no hurry to make a decision. He will wait out the next several weeks as he watches to see who expresses interest in him and then he and his agent will make a decision on what they want to do. Look for the Cubs to re-evaluate their position if they suffer no more major injuries and don't have a significant need to upgrade their team in another area. They don't want to use up their remaining trading chips to strengthen an area that they are already set at. Should the sale of the club to Tom Ricketts get finalized fairly soon then the new owner could make his first signature acquisition by landing Peavy. Time will tell how this one will play out. Peavy to White Sox: Fact or Fiction? There have been several reports this morning that the White Sox are close to completing a deal for San Diego right-hander Jake Peavy. The deal, these reports say, is only contingent on Peavy waiving his no-trade clause. Well, I spoke to a source very close to Peavy shortly after 9 a.m. today who told me nobody from the Padres organization has asked Peavy or his representatives to waive his no-trade clause. According to my source, Peavy wants to stay in the National League and he would factor in this desire if he is asked to approve a trade to an American League team.